Morgellons skin disease is a medical mystery. Doctors and medical researchers do not understand its mechanism, what causes it, how it is contracted or how it selects its victims. While top medical institutions such as the Mayo Clinic believe that other diseases explain the symptoms, some institutions, such as Oklahoma State University believe that it is in fact a distinct medication condition that can be differentiated from other possible causes. Research momentum has increased in 2011 with work by Marianne Middelveen, a veterinary microbiologist that found similarities between Morgellons disease and a disease found in cattle. Ms. Middelveen is working with Morgellons researcher Dr. R. Stricker to establish a physiological basis for the disease. She has also drawn a connection to the bacterium that causes Lyme Disease to Morgellon's. In general, Morgellons symptoms include poorly healing skin lesions, skin fibers and neurological decline. Patients sense a tingling under the skin as if they are feeling an insect or parasite. Doctor's often believe that the condition is psychological in nature and refer to it as delusional parapsychosis. There are over 13,000 families that are effected by the disease. Patients that test positive for Chlamydophila pneumonia have been successfully treated with antibiotics. Parents indicate that their kids can’t play sports, go to school or participate in most daily activities because of the pain they experience and the mental confusion. These symptoms also strike adults. The origin of the disease’s name is from 1600's France when it was used to refer to a condition describing black hairs that grew from a child’s skin. It’s interesting to note that even after all this time, no one knows what causes this disease and no one knows how to treat it. Patients feel it is caused by parasites, but the medical community is unable to prove that theory. The causes of Morgellons disease are unknown, and are being investigated by the Centers for Disease Control and Prevention and Kaiser Permanente’s Northern California Division of Research. What is known, is that this disease can be disfiguring and disabling, and affects anyone, but there is a trend that shows it is affecting an increasing number of children. Even though the CDC is trying to figure out what makes this organism tick, Morgellons disease is still not fully recognized by the medical community at large. It is now known if the disease is contagious. There are several symptoms as identified by researchers at Ohio State University that distinguish Morgellons Skin Disease from Delusional Parasitosis.  Distinct and poorly healing skin lesions with unusually thick, membranous scarring upon eventual healing. Moderate to extreme pruritis at sites of lesions as well as unerupted skin. Microscopic examination of these lesions will most often reveal the presence of unusual fibers, which may be Black, blue or red. These fibers, which many healthcare providers initially thought to be textile contaminants, are often present in the deep tissue of biopsies obtained from unbroken skin of individuals with this condition. Careful examination of these fibers further reveals that they are frequently associated with hair follicles, and are definitely not textile in origin. Most of these patients suffer from a host of neurological symptoms which can vary in severity from mild to severe. These neurological symptoms include peripheral tingling, paresthesias and varying degrees of motor involvement which appear to progress. Intermittent cognitive and behavioral status changes are often observed and also seem to progress with the severity of disease. This is often referred to as “brain fog” by the patient as they experience a waxing and waning of this symptom. Laboratory findings in these patients are variable, but often reveal eosinophilia and elevated levels of Immunoglobin E.
Other symptoms of varying severity and frequency have been described. 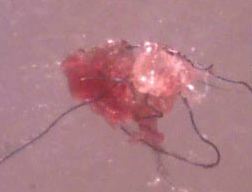 These Morgellons Pictures can serve as an initial indication of the disease. 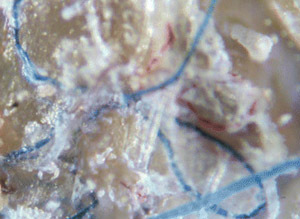 Close examination will show fibers in the skin lesions. Diagnosis of Morgellons skin disease is very difficult and generally done by ruling out other things first. Unfortunately, many doctors have never seen this disease and tend to view is as being “all in the patients mind,” as tests do not reveal any kind of abnormalities. Many children eventually given this diagnosis may test positive for chlamydophila pneumonia and may be given antibiotics. These drugs seem to resolve most symptoms, but treating this disease is mostly a hit and miss affair, based on educated guesses. "Morgellons Disease is a true somatic illness associated with Borrelia spirochetes that cause Lyme disease. Further studies are needed to determine the optimal treatment for this spirochete-associated dermopathy." 'As mentioned earlier in this article, treating Morgellons skin disease is tricky, as it does not exist in medical textbooks and no one knows what causes it. Many doctors are trying the shotgun approach, aiming to treat the global symptoms, in the hopes of addressing the skin problems. In some instances, this has been successful, but there is no set medication available for Morgellons disease. Usually what happens is the doctor tries several different medications to get results for the patient, or labels it a mental condition or psychiatric disorder. If a Morgellons skin disease patient is found to test positive for Chlamydophila pneumonia, extended use of antibiotics can help to eliminate most symptoms. Since the disease was first recognized in 2002, there is not a long history of treatment to provide guidance, however, in general, Moregellons patients are doing well with treatment. Morgellon's Disease by:Oklahoma State Center for Health Sciences Letter from Oklahoma State University on Morgellon's Disease and rationale for research project on the disease. Brochure describing Morgellon's disease and why it deserves legitimacy.